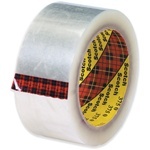 Carton Sealing Tape - 2.0 Mil Industrial - Convenient 6 Pack Acrylic Based adhesive. High tack strength. Resistant to moisture, weather, cold, UV and has a controlled unwind. Applications include: holding/bundling where moisture resistance is required, repairs tears in packaging, label protection, bundling and carton closure.